In 1978 the periodical Semiotext(e) published an issue under the title “Schizo-Culture.” The journal’s pages fused the radical writing of key figures of post-1968 French philosophy with the chaotic creativity of an emerging New York downtown art scene. The collective behind Semiotext(e), led by general editor Sylvère Lotringer and colleague John Rajchman, had previously engineered such a combustive meeting in the flesh, at a three-day conference held at Columbia University in 1975 under the same title. This now infamous event formed around divergent responses and antagonisms towards a society of control, flourishing in the wake of 1960s counterculture. 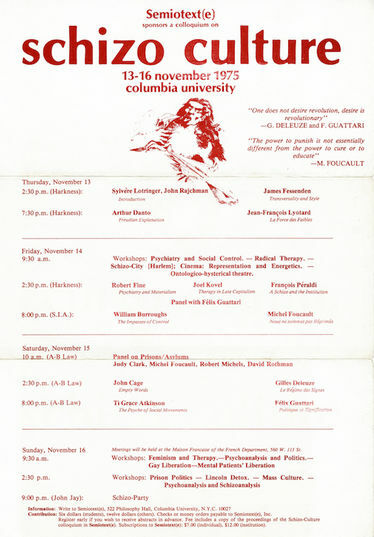 It hinged on the presence and introduction of the theories of Michel Foucault, Gilles Deleuze, Jean-François Lyotard and Félix Guattari to a New York audience, staged alongside contributions from activists, thinkers, patients and ex-cons specifically addressing the challenge of penal and psychiatric institutions. The resultant fighting and confusion exemplified the paradoxical potentialities of schizo-culture, a breaking down of old lines, and an exuberant rupturing of politics, theory and culture. Organized by Semiotext(e) in its 40th anniversary year, Artists Space Books & Talks hosts an evening bringing together artists, writers and philosophers and channeling the still potent legacy of “Schizo-Culture.” Contributions including readings, dialogues and performances will mark the publication of a slip-cased edition of The Book: 1978, a facsimile reproduction of the original “Schizo-Culture” publication; and The Event: 1975, a comprehensive record of the conference. This addition assembles many previously unpublished texts, including a detailed selection of interviews reconstructing the events, and features Félix Guattari, William Burroughs, Kathy Acker, Michel Foucault, Sylvère Lotringer, Guy Hocquenghem, Gilles Deleuze, John Rajchman, Robert Wilson, Joel Kovel, Jack Smith, Jean-François Lyotard, Ti-Grace Atkinson, François Peraldi, and John Cage. The evening will open with a reading by Lodovico Pignatti Morano, launching his new novel NICOLA, MILAN that will be published by Semiotext(e) this spring. 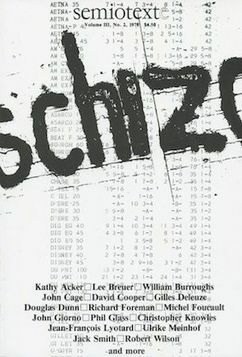 Alongside this event, a presentation of archival material related to “Schizo-Culture” will be viewable at Artists Space Books & Talks from May 14 through May 18. This display includes compelling audio recordings from the 1975 conference – the tone of the proceedings highlighting the tensions and collisions that continue to mark out “Schizo-Culture” as a prescient disturbance of the capitalist imaginary. Also on view will be artist Mary Patten’s video work Panel (2014), drawn from the transcript of one particular discussion on coercive uses of therapy in prisons and mental institutions between Foucault, R. D. Laing, Howie the Harp, and Judith Clark. With thanks to Nicolas Martin, and Fales Library & Special Collections, New York University.